This post is going to make you fat. 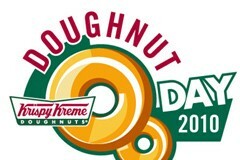 Today, Friday June 4 is National Donut Day and to celebrate Krispy Kreme is giving away free donuts to anyone who stops in. No purchase is necessary and you can pick any variety of donut you fancy. If one doesn't satisfy your sweet tooth, or if you do not live near a Krispy Kreme, head over to Dunkin' Donuts for a free donut when you purchase any beverage. Make sure your local shop is participating. One per person. Time for a donut true or false quiz. National Donut Day was founded to honor the women who served donuts to soldiers in World War I.
Dunkin' Donuts sells 2.5 million donuts and Munchkins donut hole treats every day. Krispy Kreme sells donuts in Hawaii, but not Alaska.